Favourite Book : How Bad Do You Want It? My name is Shelley Doucet and I am from New Brunswick, Canada. I am a trail, mountain, and road runner; mother of two (Myles and Ava); Professor in Nursing at the University of New Brunswick; community volunteer; and proud ambassador for Salomon, River & Trail Outdoor Company, Liv9 Nutrition, and Suunto. I started my competitive running journey in 2014, after my husband and I were busy with two young children and discovered that we could save half our time if we took our dogs for a RUN each day instead of their normal walk. As I do with all things in life, I took on running at 110%. I hired one of Canada’s top elite endurance coaches, John Lofranco, and he is helping me reach my potential on the roads and in the woods. I have gained so much from the running community and enjoy giving back through co-organizing charity races with my husband and just sharing my passion for running and inspiring other people to get outside…and of course make sure I find time to do the same daily! I have an INCREDIBLE support network who share my passion for running, allowing me to go after my ambitious running dreams. And now the LONG Story…. From a young age, I spent many hours playing and running outside with my sister Marcie and brother Jeff, having grown up in the country on 10 acres. We did not have cable TV or other distractions and would go outside when the sun rose and return when it set. I was also actively involved in a variety of organized sports, such as basketball, ringette, hockey, and soccer. This later carried over into playing on provincial (rugby, soccer) and university (hockey, soccer) sports teams. I always tended to stray away from individual sports, such as track, as I preferred to compete as a team. The reality is that I would put too much pressure on myself otherwise. My first real taste of running a race came in my final year of high school when it was mandatory for all soccer players to run cross country. I ended up winning the cross country provincials in Fredericton that year. I was offered running scholarships at two Maritime universities but, despite a lifelong love for running, I had no interest in pursuing racing so I immediately declined without further consideration. Throughout my undergraduate and graduate education, I maintained an active lifestyle, which involved team sports, strength training, and a daily 5K walk with my husband and two Airedale Terriers. In 2013, when I returned to work full-time after a maternity leave, my husband and I were busy with two young children and demanding jobs, making it hard for us to find the time to walk our dogs. We soon discovered that we could save half of our time if we took our dogs for a run each day instead of their normal walk! That August, I heard that Marathon by the Sea in New Brunswick was taking place in a matter of days. Those who know me would not be surprised to hear that I seriously considered signing up for the marathon. Thankfully, my husband talked me out of this and agreed to run the half with me – we signed up for the half the day before the event. I have to admit, our handful of 5K runs did not prepare us for this new challenge and all I could think of during the entire race was thank heavens I did not sign up for the marathon! I vividly recall us joking about everyone with their gels and big fancy watches prior to the race. Halfway through the race, we were offered a gel and I admit that I quickly came to appreciate what these were for! Our two young children, my sister, and mother followed us throughout the entire race, which was the best part of all. Our children held signs saying “Go Mommy, Go Daddy”, which evoked a feeling that beat any local or national sporting event I had ever participated in. I finished the race second in my age group, with a time of 1:43, and was hooked. I went home that afternoon and registered for the KV Challenge Marathon that was taking place eight weeks later. The next day I also bought one of those fancy GPS watches that I had made fun of the day prior, and a case of vanilla gels. In my first year of racing in 2014, I had the top women’s time in New Brunswick for the 5km, 10km, 10 mile, and half marathon distances. Jumping ahead, over the next two years I experienced two injury setbacks due to inactive gluteal muscles. While injured, I never gave up in my recovery and maintained my fitness by running in the pool for a minimum of two hours daily (some days over 3 hours), plus additional cross-training. To avoid further injury and achieve my ambitious running goals, I hired one of Canada’s top elite endurance coaches, John Lofranco. I also decided to spend less time on pavement and more time on the trails. 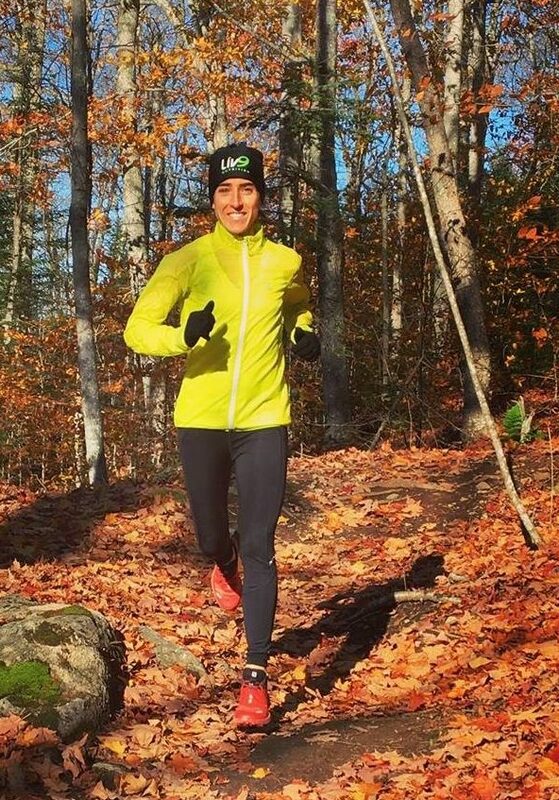 After returning to running and participating in the Hopewell Rocks 8.5k trail race and the 25k Rockwood trail race, I fell in love with trail running and even secured support from River and Trail Outdoor Company and Liv9 Nutrition, which is a client-centred company that develops custom formulations without unnecessary ingredients for endurance athletes. I also became a local ambassador for Salomon at that time through the support of the Atlantic Canadian Salomon representative, Adam Purcell. I feel very honoured that these companies believed in me and my trail running potential so early on. My most important and enjoyable role is being a mother to an energetic five year old girl and a compassionate seven year old boy. I generally train in the very early hours so that I do not miss out on family time. I am very fortunate, however, to have an incredible support network who share my passion for running. My husband is super supportive of my training. I think he learned early on in our marriage that I am much more pleasant to be around when I have had the chance to exercise. My mother, who lives with us, makes it possible for me to train with my husband, which is something I realize few couples have the opportunity to do. My children also see me training and racing with their dad and aunt, which at a young age is allowing them to see firsthand that physical activity is an important part of everyday life. In fact, my children actively participate in the kids fun runs held at many running events. I cherish my relationships with family and friends, and never lose sight of their importance. I am very passionate about providing opportunities for children in need and spend many hours volunteering my time to promote health among children in New Brunswick. For example, I co-organize two charity running races with my husband for children in need in our community. One event is the Quispamsis Run and Swim held in the summer and includes 1km and 3km trail races for children, in addition to the main 5km event. All proceeds go to PRO Kids Saint John, a non-profit organization that provides funding for underprivileged youth to participate in sport and recreation activities. The trail events are a great opportunity to encourage children to get outside and be active, in the woods! Over the winter we host the Fill the Stocking 4k fun run that precedes the local Santa Claus Parade to raise funds to support children in need at Christmas time. In addition to these events that we co-direct, I also assist with many children’s races at other events and am always willing to lend a hand at races when I see a need. My program of research is also focused on promoting health among children. For example, in 2014 my research team secured one million dollars to launch a navigation centre for children with complex health conditions in New Brunswick called NaviCare/SoinsNavi. I aspire to be a good role model for children and through my volunteer activities and, through my research, provide them with opportunities to reach their full potential. My volunteer interests extend in other areas, including being an ambassador for trail and road running in New Brunswick. For example, I am committee member with RunNB, the local association for running in our province. I am also one of the leads for a trail running group Monday evenings and take runners to a different location each week to explore new trails in our community. This weekly run is organized through the local River & Trail Outdoor Company store, one of my main supporters. Finally, I am the Atlantic Director of the Association of Canadian Ultramarathoners. My interest here is to help promote ultra trail running in the Atlantic Provinces, and also to broaden my own network. Given that I am only early in my running career, I do not yet know my perfect race distance. I am eager to explore ultra trail races, as I believe that I have more potential the longer the distance and on the trail, but above all this is where I am most happy. I am excited to discover how far I can go, both physically and mentally, all while being connected with the outdoors. If I were to choose a distance today that I believe would be my best distance I would say 50 miles to 100k; however, I love the opportunity to challenge myself in different ways across different distances. I also love to race and push myself to my limits, but even more so I simply love to just run outside and discover new places. On average I run around ten hours per week and take one day off from running for recovery (usually Fridays, which is when I get my weekly massage). In addition to running, I do 45 minutes of Yoga, Pilates, and Tai Chi daily. This is my favorite part of the day, as it gives me a chance to unwind and listen to podcasts, which range from running podcasts (e.g. The Shakeout Podcast, Ultra Runner Podcast, Trail Runner Nation) to podcasts focused on leadership and collaboration. Occasionally my children join me, when they wake up early. I also strength train three days a week at Afterburn, plus do core work daily. And of course I spend many hours playing outdoors with my two young children, husband, and dogs.